This entry was posted in Chickens and tagged baby, chick, chicken, dinner, raising chickens, wedding. Bookmark the permalink. Re organic corn for your chickens: obviously, this year you’ll do what works for you, but thinking about next year…I started growing organic corn for my chickens a couple of years ago. It’s very satisfactory to know that Monsanto hasn’t got anywhere near what my animals eat. Corn is very suseptible to gm firtilization so even when we buy non organic corn that the farmer swears isn’t gm…well, I figured it’s better to do it myself. I now grow the best eggs, best chickens anywhere. 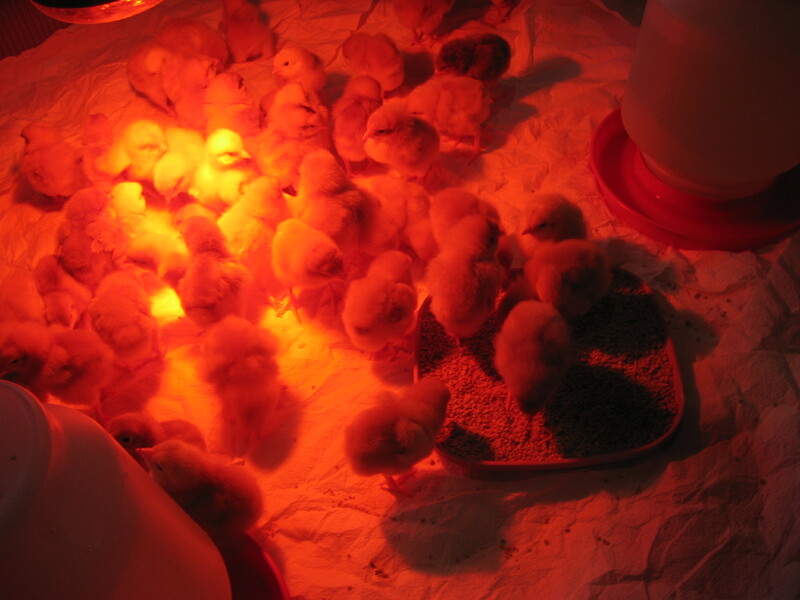 I bought ten chicks on March 29, 2009. They have never had commercial food of any kind. I get leftover fruits and vegetables from a grocery, a farmer’s market, and from dumpsters. I saved all eggshells before I got them and crushed the shells to feed them for calcium. Of course, you won’t be making eggs, so that is not a problem. My chicks ate leftover everything. Now, they are large, healthy girls who lay wonderful orange-yolked eggs. Feed has cost me nothing. They get all my banana skins and apple cores, lettuce gone bad, anything. Maybe you can adopt this method to feed yours and cut down costs. Maybe your friends can save scraps for the chickens’ food. I love the story of your raising food for the wedding dinner. I hope to hear more. People think I am crazy when I say I will cater my own wedding if I ever remarry and marry in my yard. You have certainly raised the bar for me! I meant to say that my chicks get their protein from tuna and chicken and eggs. I can confidantly say they have never had antibiotics or hormones. Often, I buy chicken cheap parts I will not eat, cook for the hens and feed them for a week from what I cook. They also get to pick the bones of any hen baked. Anything that has been on the shelf or in the freezer too long is hen food. Of course, you would be dependent on the kindness of strangers and friends to be able to feed that many chickens. Good luck.